First you have to know something about the Solar panel, its output voltage, current etc. A Solar panel is like a battery that delivers voltage and current. It consists of an array of Photovoltaic cells made up of semiconductor. When the Photons of the Sunlight hit on the Solar cells, it generates a voltage. Typically, each small Solar cell generates 1V in bright sunlight. Solar panel is usually designated in terms of its output power. For example, a 10 Watts Solar panel gives 10 Watts output power. As you know, Power is the Volt x Ampere (Current). For example, 12 V 10 Watts Solar panel delivers 840 Milli Ampere current. If you know the Volt and Watts of a device, you can calculate the Current in Amps. The Open circuit voltage of a 12 volt Solar panel will be about 20 volts in full bright sunlight , but it reduces between 14-16 volts when the load ( battery ) is connected. So a 12 volt 10 W Solar panel gives around 800 mA in bright sunlight which is sufficient for charging the Lithium – Ion batteries used in Laptops and Notebooks. For example, my DELL Laptop uses Li-Ion battery rated 14.4 V 2.69 Ah ( 2690 mAh). So it needs only 269 Milli Ampere current to get full charged in 10 hours. So first check the battery voltage and Ah to be charged. Some batteries are 18.5V or 19.5 V. You can calculate the charging current and voltage using some formula. For Example, 2.69 Ah x 0.1 = 0.269 Amps or 269 Milli Amps. Ah / Amps. If we use 1C Current, irrespective of the Ah of battery, it takes 10 hours for full charging. Cost of the Charger will be around Rs. 1000. 10 W Solar panel costs around Rs.800. The cost is typically Rs.80 per watts. V out = 1.25 x ( 1+R/1K). Where R is the value of the Preset. IC XL 6009 is the 400 KHz 60 V 4 A switching Current / Buck-Boost/ Inverting DC/DC converter chip. When the Solar panel is placed in bright sunlight, it outputs a voltage based on the intensity of sunlight. This voltage passes through diode D1 to the DC-DC booster module. High value Capacitor C1 acts as a buffer to make the input voltage stable even if there is slight drop in voltage from the solar panel. LED indicates the output voltage from the panel. Use DC jack for connecting the Solar panel with the Module with correct polarity. Double check the polarity of Solar panel and the Module before connecting. 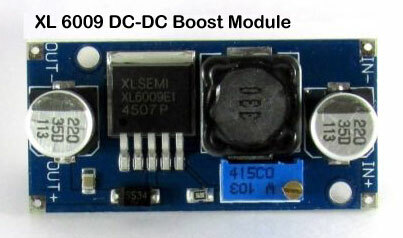 Output from the Module is used to charge the Laptop battery. Use suitable pin that insert properly into the socket of the Laptop. Before connecting with the battery, adjust the Preset to get desired voltage. Two volts excess than the battery voltage is ideal. A Digital Multimeter is needed for this. Keep the Solar panel in bright sunlight and measure the output voltage from the module. Slowly adjust the preset, till the output voltage rises above the voltage of the battery. 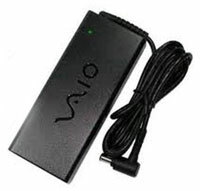 For example, if the battery is rated 14.4 volts, adjust the output voltage of the Module to 16.5 or 17 volts. Then connect the output pin to the Laptop. Again adjust the preset to get desired output voltage ( 2V excess than the battery voltage ).